Place the masarepa in a medium-sized bowl. Add the oil, salt and 1½ cups (375 ml/12½ fl oz) water and stir to combine. Turn out onto a clean work surface and knead to form a smooth dough, adding a little more water if the dough is too dry. Divide the dough into twelve even-sized portions and shape each portion into a ball. Flatten each ball to make a disc, about 1 cm (½ inch) thick all over. Preheat a barbecue chargrill or hotplate to medium. Brush a little butter over the chargrill plate and cook the arepas, in batches, for 2 minutes on each side, or until golden. 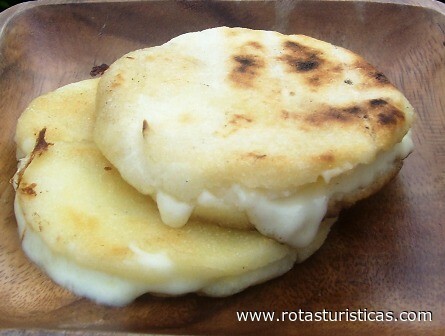 When all of the arepas are cooked, cut them in half crosswise, being careful not to cut all the way through. Stuff with cheese and grill for a further 20 seconds on each side, or until the cheese has melted. Serve hot with the Guasacaca on the side or spread over the cheese.